Baishaki is the harvest festival celebration with great pop and splendor. According to the Nanakshahi Solar calendar, Baisakhi marks the beginning of Sikh New Year. This festival is of great importance among the Sikh community. According to the Hindu calendar, Baisakhi falls on the first month of Bikram Samvat. Baisakhi is so called because it marks 'Baisakh', the first month of the Bikram Sambat Sindhi calendar.This year it will fall on 14th April (Sunday) 2019. This day is very important as this day marks the establishment of Holy Khalsa, by the tenth Sikh Guru, Guru Gobind Singh in year 1699. This festival is more popular in Punjab. They celebrate this harvest festival with much pomp, fervor and feasting. Punjab thanks God for good harvest. Farmers convey thanks to God for better crops. The festival is celebrated at the time when Rabi crop is ready for harvesting. Sikh community located anywhere in the world celebrate Baisakhi by participating in the special prayer meets and Baisakhi processions. For the Sikh community, the occasion of Baisakhi is even more special and momentous. The holy festival of Baisakhi celebrates the birth of Khalsa. The stories go back many years. The tenth Sikh Guru, Guru Gobind Singh was the son of Guru Teg Bahadur. According to the historical viewpoint, Guru Teg Bahadur was beheaded publicly by the Mughal ruler Aurangzeb. The reason behind this incident was Guru Teg Bahadur, stood up for the rights of Hindus against the Muslim ruler. So after the death of Guru Teg Bahadur, his son, the tenth Sikh Guru, Guru Gobind Singh became the next Guru. In 1650, Punjab was in turmoil and was facing the corrupt rulers where people were given no rights, neither there was any law, nor justice. Especially, the weak were suffering constantly and quietly. Therefore, this is the day when Guru Gobind Singh wished to instill the strength & courage among all. At Anantapur, he assembled the whole Sikh community for meeting. In this meeting he raised his sword, he asked the people to raise their voice against unfair and ask for justice. He motivated Sikh community to come forward and be ready to die for truth. Finally the five Sikh stood up, who were popularly known as Panj Pyare (The Five Beloved Ones) by Guru Gobind Singh. Then instead of killing, Guru Gobind Singh baptized them and the first ceremony of Amrit initiation held. They were then the “baptised Sikhs”, who were given the name “Khalsa”. Since then, the festival of Baisakhi is being celebrated in the entire world by the Sikh community. In the year 1699, the Holy Khalsa was established. The Khalsa (Sikhism) was established to protect the mankind from the atrocities of Mughals. The Baisakhi celebration is mainly concentrated around Gurdwaras and in the open fields doing the Bhangra and Gidda dance. An important ritual carried out during Baisakhi is 'Awat Pauni'. Here, people come together and harvest crops on vibrant beats of dhol and sing melodious folk songs. “Nagar Kirtan” is another ritual carried out by Sikh Community on the special occasion of Baishaki. Nagar Kirtan literally translates to the "town hymn singing". People gather together and sing hymns and chants written in the Guru Granth Sahib -the Sikh holy book. The group is led by five Khalsa who are dressed up as Panj Pyaras, who carry the holy book with them as a mark of reverence. In the morning, on the pious day of Baisakhi the Sikhs wake up early and attend special prayer meetings at Gurudwara. The holy book is given a symbolic bath with milk and honey at Gurudwaras, on the special occasion of Baisakhi. The holy book is then placed at the special throne with special care. After that, the spiritual leaders read them loud, where the followers listen them carefully. Also, on this day a special holy nectar or Amrit is prepared in an iron vessel and is distributed amongst the devotees after the verses are chanted. According to the tradition among Sikh community, the devotees sip the Amrit five times in a row. Finally the arrangement of Langar (The free food) is carried out. In the ancient time, when the main occupation of the Indians was farming and agriculture was the sole occupation. The real significance of this festival was that it was the time when the "new beginning" of the solar calendar takes place and the farmers thank the God for the good harvest. In modern time also when the agriculture is aided with modern technology , Baisakhi has not lost its importance. The holy teachings led by Sri Guru Nanak Dev Ji are still prevalent and practiced across the Sikh community. Langar (the free food) is the part of his teachings, which served free of cost in the Gurdwaras. Farmers celebrate Baisakhi as a thanksgiving day. 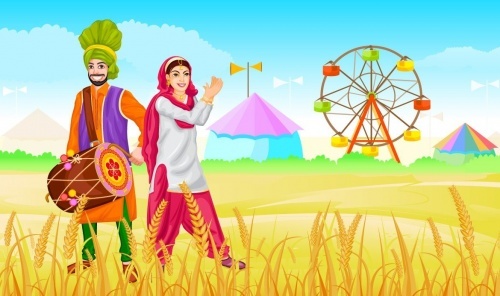 On the special occasion of Baisakhi, farmers take bath in ponds or rivers and visit Gurudwaras to thanks God and express sincere gratitude to the supreme power for the bountiful harvest and pray for prosperity and good times in future. Fairs are also organized in some parts of Punjab. People participate in these fairs with great enthusiasm. Major attractions of Baisakhi Fairs are the bhangra and gidda performances besides wrestling bouts, singing and acrobatics. Performance of folk instruments - vanjli and algoza is also quite popular. Food stalls with authentic Punjabi cuisine and shops adds more charm to the colorful Baishaki fair in Punjab. Baisakhi coincides with the other festivals celebrations in other parts of India too. The auspicious day of Baisakhi is celebrated all over India though under different names and with different set of rituals. People of Assam celebrate April 13 as Rongali Bihu, while those in West Bengal celebrate it as Naba Barsha. Bihar celebrates Baisakhi as Vaishakha in honour of the Sun God, Surya while Kerala celebrates it as Vishu and Tamil Nadu as Puthandu. In Kashmir, a ceremonial bath and general festivity mark Baisakhi while in Himachal Pradesh devotees flock to the temple of Jwalamukhi and take a holy dip in the Hot Springs. Baisakhi has a very special significance in Buddhism too. Read more- Why Jhulelal Jayanti celebrated?